An elderly Sikh who describes Islam as a "beast" and once provided a character reference for Nick Griffin during his racial hatred trial is set to become the British National Party's first non-white member. 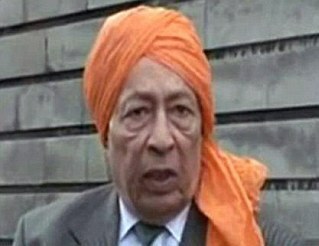 Rajinder Singh, an anti-Islam activist in his late seventies who blames Muslims for the death of his father during the Partition of India in 1947, has been sympathetic towards Britain's far-right party for much of the past decade even though he currently remains barred from becoming a member because of the colour of his skin. But last weekend the BNP's leadership took their first steps towards dropping its membership ban on non-whites after the Human Rights Commission threatened the party with legal action. The move will be put to a vote of members soon. In December 2001 Mr Singh and another Sikh from Slough who goes under the name of Ammo Singh announced their intention to set up an Asian Friends of the BNP group to act as a supporting body and conduit for funds for people sympathetic to the party's anti-Islamic stance. Sikhism stresses equality for all human beings. Therefore Sikhs who are true to their faith, will having nothing whatsoever to do with any party that favours any one section of the community. Far from "living a quiet life", Rajinder Singh (left) has been knocking around for years - see this piece from the Guardian from 2001. He has practically no support within the Sikh community but is attracting attention again now because the BNP is unable to accept any new members until it changes its constitution and membership criteria, following a legal victory by the Equality and Human Rights Commission. But will one particularly deranged ethnic member really be enough?